Do you ever worry about your kids? Are you sometimes exhausted before the day is done? Have you wondered if you’re up to the task of being a mom? Exchange fear for your kids’ well-being for confidence in God’s sovereignty over their lives. Pray effectively on your kids’ behalf. Enjoy the sweetness of God’s presence in the midst of motherhood’s demands. Originally published by Harvest House, this book has ministered to mothers worldwide. It makes a great gift for secret sisters, baby showers, Mother’s Day, birthdays, Christmas. Ideal for single moms, too. Even grandmothers enjoy the stories and applications in its pages. A wonderful devotional book for busy moms. When is a ‘time-out’ anticipated with great joy? 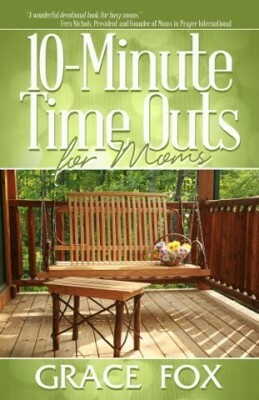 When it is one of the 10-Minute Time Outs for Moms! Relax, refresh, renew, and rejoice as you invest 10 minutes in a closer walk with the Lord.